The British Tar at Omoa, William Humphrey, 1780, British Museum. It has been 238 years since the Battle of San Fernando de Omoa. After Spain's entry into the American Revolutionary War, a British expedition was dispatched to what is today Honduras, and stormed the works with sailors and soldiers. The strategic effect was completely neutralized when the Spanish returned and retook the fort shortly thereafter. For this war, the numbers involved were small and the casualties light. The only real legacy of the battle is the surviving fortifications which stand as a tourist attraction to this day. 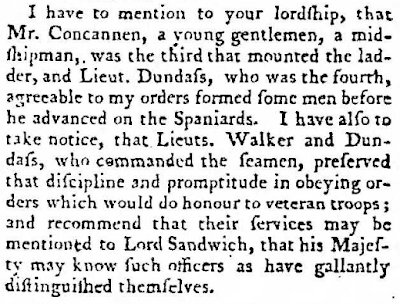 Your lordship will pardon my mentioning an instance of an elevated mind in a British tar, which amazed the Spaniards, and gave them a very high idea of English valour: not content with one cutlass, he scrambled up the walls with two; and meeting a Spanish officer without arms, who had been roused out of his sleep, had the generosity not to take any advantage; but presenting him with one of his cutlasses, told him, "You are now on a footing with me." 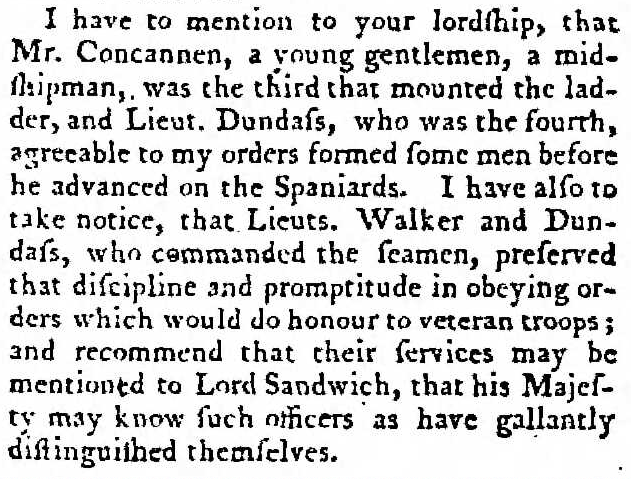 Dalrymple's full letter, including the above anecdote, was included in the December 18, 1779 edition of the London Gazette. The following year, modified versions of the story started circulating in British papers. Both the Adams Weekly Courant (published in Chester) of April 4, 1780, and the Edinborough Advertiser of the same day included the same, modified version of Darlymple's original tale. 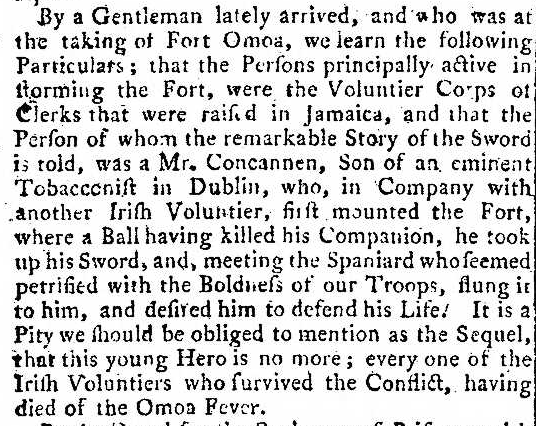 It was not a sailor, but an Irish volunteer soldier named Concannen who 'flung' his dead companion's sword at the feet of a 'petrified' Spaniard. This story appears to be a (perhaps deliberate) misreading of Darlrymple's original dispatch. 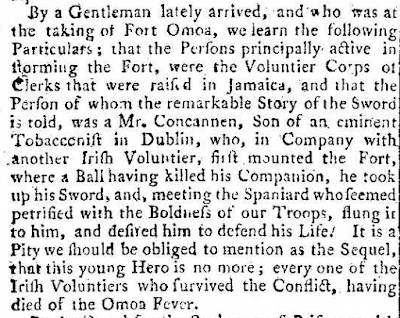 Mr. Concannen does appear in the dispatch as one of the first up the ladder to storm the fort, but he is a naval midshipman, not an Irish volunteer. The elevation of the main character from a common and nameless sailor to a relative gentleman did not take hold. Conforming to the trend of depicting Britannia as a manful, violent, and strong British sailor, artists took up the image of the British tar at Omoa, offering his sword to a powerless Spanish officer. Over the next two weeks, I will be examining different prints depicting this scene, stretching from 1780-1790. Today I begin with William Humphrey's print. 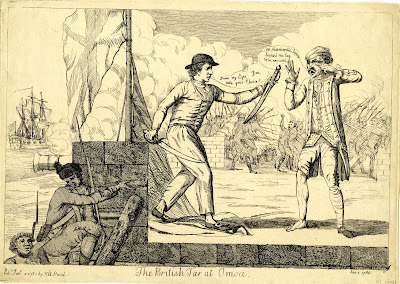 This is the earliest print depicting the British tar at Omoa that I am aware of. 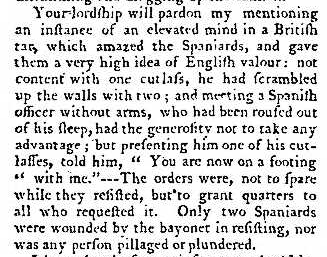 Humprey's sailor strides forward to offer a sword to an embarrassingly unprepared Spaniard. In the background a phalanx of bayonets drives away Spanish grenadiers, to the sound of a ship's broadside at the left. The cowering Spaniard declares 'Ah Misericordia Segnor Inglese! me beg to be excused,' while wiping tears from his eyes. 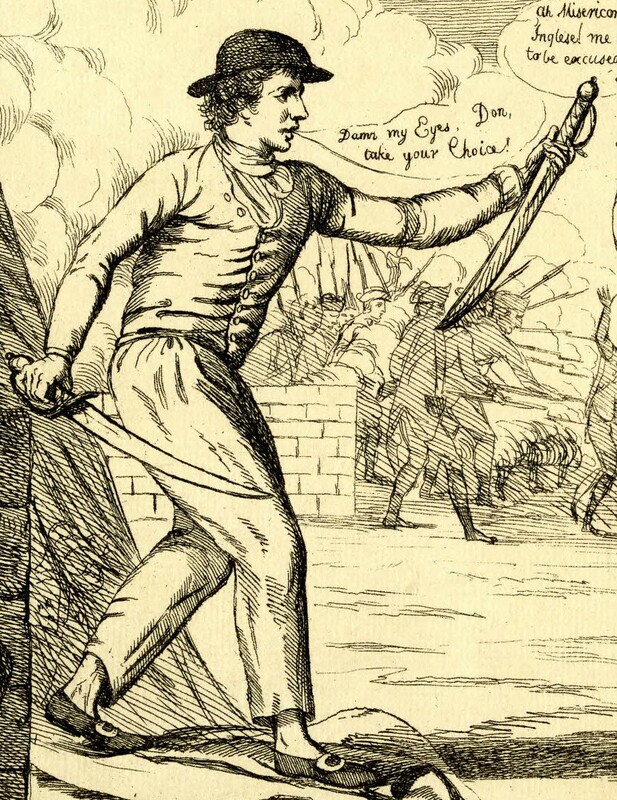 The British tar's trousers are white, and end above the ankle, cinching close at the waist. His jacket is single breasted, ending at the waist, or perhaps tucked into the loose trousers. His jacket is fitted with simple, unadorned cuffs. The sailor's neckcloth is tied almost like a neckstock. Over short and loose hair he wears a round hat with a short brim.